If China wants to do better in international football it needs to do more to get its kids to play the game. Missing out on the football World Cup may be a familiar state of affairs for Chinese fans, but it doesn’t make the quadrennial disappointment any easier to take. Last month, the national team crashed out at the penultimate stage of qualification for the 2014 World Cup leaving the 2002 tournament as its only appearance on the global stage – the same as the United Arab Emirates and Kuwait, and less than North Korea. Don’t even mention Japan or South Korea. And so start the debates in the international media in which the question is invariably asked how it is that a country of 1.3 billion can’t find 11 decent football players. That isn’t really the right question. What should be asked is that in such a country, one that actually likes the beautiful game, why it is that not that many people actually play it. Japan has a tenth of the population, but 360,000 registered Under-12 players. China has less than 10,000. Such a shocking statistic suggests that the gap between the Asian Champions and the Middle Kingdom is only going to get greater, and in the short-term it is. As for the long-term, that doesn’t even bear thinking about unless something changes soon. Japan’s first World Cup was only four years before China’s debut. Like China, it lost all three games. But unlike China, the Samurai Blue improved, returned and performed better. It’s hard to imagine that Japan won’t be in Brazil in June 2014. The team breezed through the penultimate round of qualification with two games to spare. China fell at that hurdle for the third successive time – it can’t even reach the final stage. The group with Iraq, Singapore and Jordan didn’t seem that tough, especially when you only have to finish in the top two to progress. But it’s when things are supposed to be easy that Chinese fans start to worry. 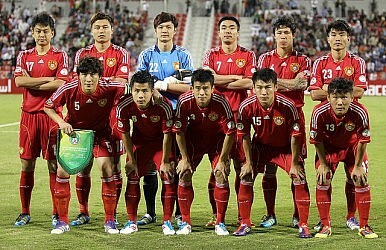 After an opening game win at home to Singapore, China proceeded to lose the next two, in Jordan and then at home to Iraq. That meant they went to Doha on November 11 (Iraq’s temporary base as FIFA were worried about the security situation at home) looking to win to stay in with a realistic chance of finishing in the top two in the group. I was there and saw Iraq score a last-minute goal to win the game 1-0 and condemn China to four more years of hurt. In the press conference after the match, the team’s Spanish coach, Jose Camacho, appointed in August, just shook his head and talked of the need to improve. The Chinese Football Association (CFA) has declared that the former Real Madrid boss will be kept in place for the long-term to help the game’s grassroots. It’s necessary. The money is there, it’s just that it hasn’t been spent in the correct places in the past. With China still developing at a startling rate, much has been made of the parents of largely single children and their desire to see them spend their free time studying, or at least take up sports like tennis in which time and money invested have a much greater correlation with future rewards. Yet South Korea and Japan, neighbors that are far more successful in football terms, have education systems that are no less demanding and societies that are in some ways more competitive. It all comes down to getting the kids to play, and giving them the facilities and the coaching to do so. It may take years, but then Chinese football at the national level hasn’t got much else to do for the foreseeable future.